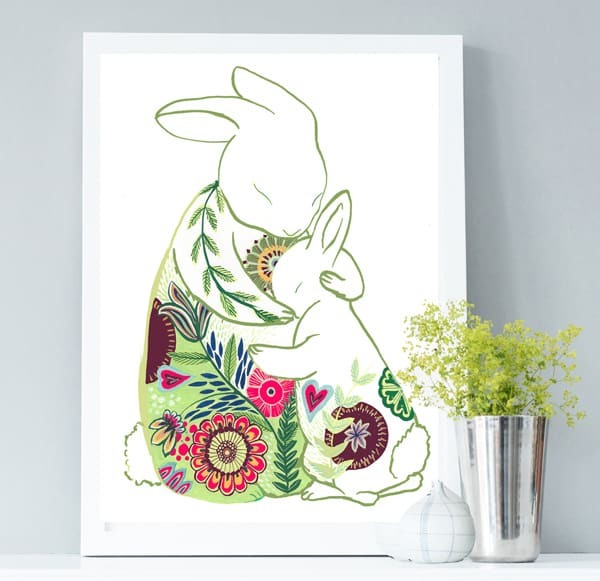 Rabbit Print – gift for Mum on Mother’s Day – Mummy & baby rabbit – A gorgeous contemporary art print featuring Helena’s adorable hugging rabbits. 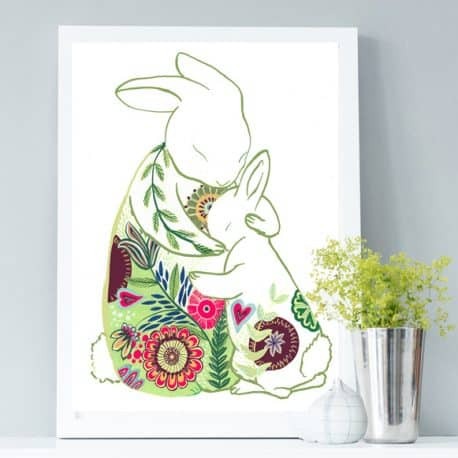 Mummy and little rabbit enjoying a good cuddle – nothing else matters in that moment. Taken from a beautifully painted original which took inspiration from Helena’s Polish heritage. Designed exclusively by Helena Tyce Designs. Copyright © Helena Tyce Designs 2018. All Rights reserved. We think this makes a particularly lovely Valentines gift. You can even substitute the word "love" for your own names (see the examples on the right). 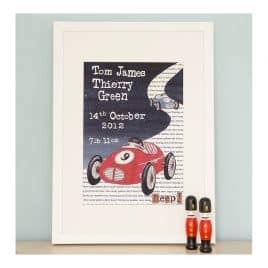 Please complete the personalisation boxes if you would like your print personalised. 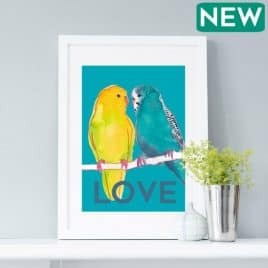 If no personalisation is chosen your print will appear with "LOVE" at the bottom as in the first image. If framing is selected your print will be mounted in an off white conservation mount framed in a white, black or oak frame as shown in the photos. 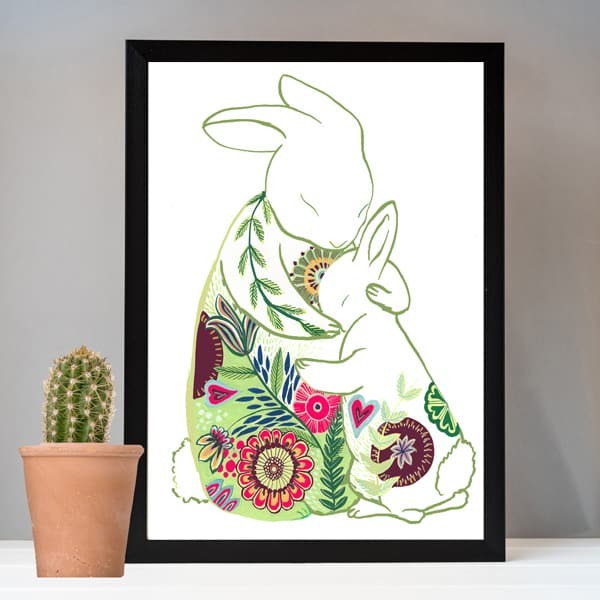 A4 prints are mounted and framed in A3 frames (29.7cm x42cm) We use lightweight framing materials and perspex glazing which has exactly the same appearance as glass. It has the additional benefits of safer transit and fewer breakages. Your framed prints will be carefully packaged and boxed up to arrive in pristine condition. 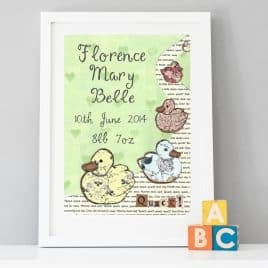 A extremely cute personalised print based on the rhyme "5 little ducks went swimming one day". 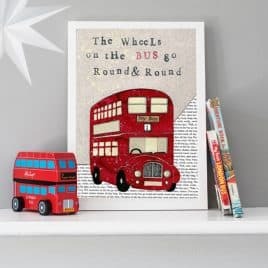 Based on an original mixed media artwork in Helena's signature style - painted, collaged and hand printed with letter press type. 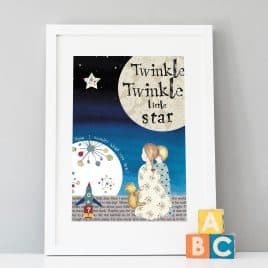 This lovely children's print is the perfect personalised baby gift or birthday present. 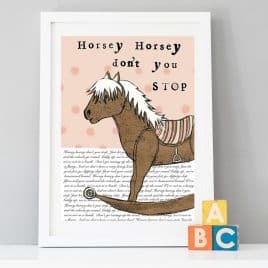 Or to compliment your own nursery or playroom. 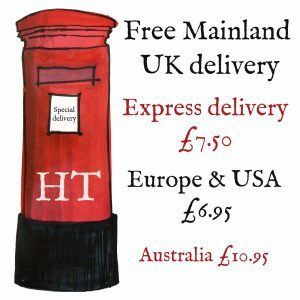 All of Helena's work is produced in the UK, locally if possible. 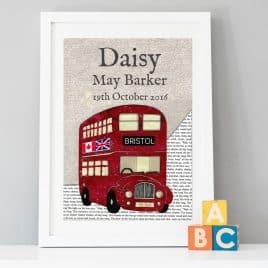 Your print can be personalised with up to three names, baby's date of birth and weight. If there is something you would like adding please get in touch - we love to hear new ideas and will always try and accommodate.